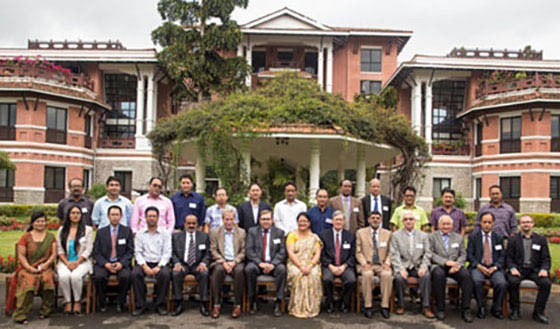 ICIMOD, in collaboration with the World Meteorological Organization (WMO), organized the eighth Regional Steering Committee (RSC) meeting for the HKH-HYCOS project. This final SRC meeting of the current phase was held from 22 to 24 September 2014 at the ICIMOD headquarters in Kathmandu. Participants from Bhutan, Bangladesh, Nepal, and Pakistan as well as the WMO, Government of Finland, Finnish Meteorological Institute, ICIMOD, and international experts reviewed the project progress and endorsed a project proposal for the next phase, focusing on delivering lifesaving flood warning messages to vulnerable communities. The project has upgraded 37 hydromet stations in Bangladesh, Bhutan, Nepal and Pakistan. These stations can now automatically observe rainfall and water level measurements. The project has established web-based regional and national flood information systems for sharing real-time data and information for reducing risks. The project is also piloting a regional flood outlook model using Mike 11 hydrological software. Apart from real-time hydromet data from the 37 stations upgraded by the project, freely available rainfall forecast data is being inputted into the flood outlook model to add value and improve accuracy of the model. In order to sustain the initiative, the project has focused heavily on enhancing partner organizations’ technical capacity in flood forecasting and communication, and sought public private partnerships, especially with telecom operators, for disaster risk reduction. In view of the imminent funding shortage between the end of the current phase and the next phase, RSC members have committed to supporting some of the project activities through their national budget.